He is Bronx-born Brian Conway, the Irish Echo's Traditionalist of the Year for 2008. Conway joins previous Irish Echo honorees Charlie Lennon, James Keane, Joe Derrane, Seamus Egan, Joanie Madden, John Whelan, Mick Moloney, Liz Carroll, Kevin Crawford, Seamus Connolly, Mike Rafferty, Andy McGann (posthumous), Monsignor Charlie Coen, Kathleen Biggins and Brian O'Donovan (co-recipients for 2006), and Micheal O Suilleabhain. It is fitting that Brian Conway is now in the same elite list as his beloved friend and mentor, Andy McGann (1928-2004), who was a direct link back to Sligo fiddling legend Michael Coleman (1891-1945) in New York City. Coleman, McGann, Martin Wynne (1913-1998), James "Lad" O'Beirne (1911-1980), James Morrison (1893-1947), Paddy Killoran (1904-1965), and Paddy Sweeney (1894-1974) are all part of a Sligo-shaped New York fiddling fraternity and represent a nexus of breathtaking scale. 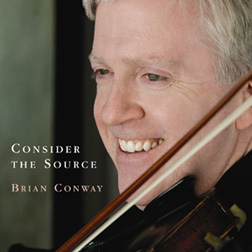 It would make any younger fiddler's head spin, yet the 47-year-old Conway has admirably risen to this challenge of connection while also burnishing his profile as a musician of separate, consummate skill. All of his albums reflect esteem for those fiddling forebears without any trace of slavish imitation. They include "The Apple in Winter" with fiddler Tony DeMarco in 1981; "First Through the Gate," Conway's magnificent solo debut that was the Irish Echo's No. 1 traditional album of 2002; and "A Tribute to Andy McGann," a superb 2007 homage that Conway recorded with button accordionist Joe Burke and pianist Felix Dolan. But "Consider the Source," a Clo Iar-Chonnachta CD in 2008, tops them all. Conway's fiddling unfailingly finds the elusive seam binding virtuosity, vitality, risk, and invention. It is a must-have recording. Those who can, do and teach, and Conway is one of the best music instructors anywhere. This busy Deputy Chief of the Public Integrity Bureau in the Westchester County District Attorney's Office in White Plains, N.Y., can claim Maeve Flanagan (his niece), Dylan Foley, Pat Mangan, Kira Jewett, Colin and Brian Lindsay, Gene Bender, Shane Cornyn, Kathleen Parkes, and Caitlin Finley as past or present fiddle students who benefited greatly from his tutelage. Conway also uses the Internet to instruct Ceilidh Briscoe, a young girl in British Columbia, as well as other young pupils in the Detroit area. This past summer he additionally taught at the Catskills Irish Arts Week in East Durham, N.Y.
For the past 11 years Conway has organized and hosted a very popular Wednesday night session in Dunne's Pub in White Plains. His guests have included Joanie Madden, Catherine McEvoy, John Whelan, Jerry O'Sullivan, and Felix and Brendan Dolan, but the emphasis is on inclusiveness to encourage beginner, journeyman, and high-profile performers alike. One of the most stirring concerts of 2008 took place on Jan. 5 at the Irish American Community Center in East Haven, Conn., where Conway, Joanie Madden, Billy McComiskey, and Brendan Dolan performed as the Pride of New York Band. There is no better Irish traditional instrumental quartet in America than the affectionately dubbed PONY. Conway's own schedule of concerts and short tours in the U.S. and Ireland increased in 2008 to keep pace with his mounting acclaim. Throughout his musical life Brian Conway has paid the highest respect to those who came before and made an enduring difference. The Irish Echo is proud to pay its highest respect to Brian Conway for making the same enduring difference by naming him the Traditionalist of the Year for 2008. It is this newspaper's most prestigious annual accolade for accomplishment in Irish traditional music.